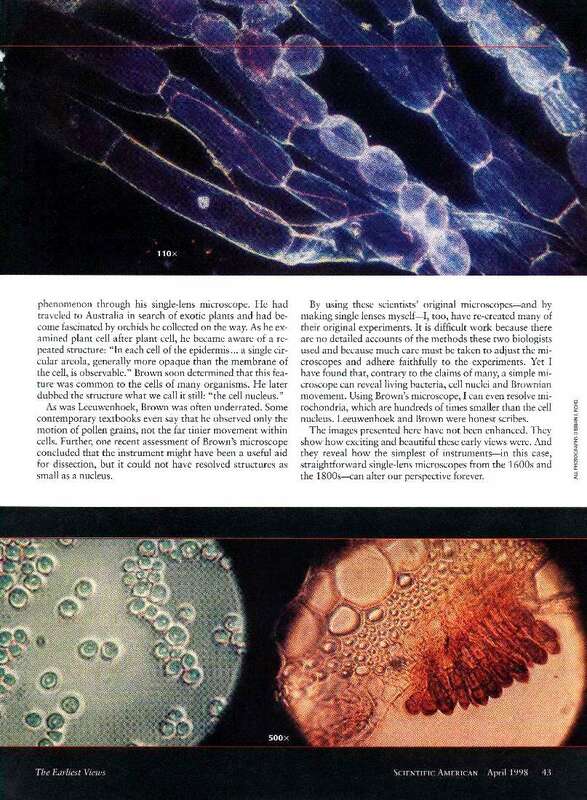 Text from Scientific American, 278 (4): 42-45, 1998. Download original article: Page 42, Page 43, Page 44, Page 45. Each page is about 200kb and may take a minute or so to download. Re-creating the experiments of pioneering microscopists reveals what they actually saw with their simple, single-lens instruments. Leeuwenhoek, who lived from 1632 to 1723, had inadvertently launched the field of microbiology. Working in an era before the science of optics really flourished, Leeuwenhoek himself constructed more than 500 microscopes. Using these basic instruments, he recordedin addition to the animalcules, or microbesmany cellular structures as well as the existence of red blood cells and spermatozoa. He also described bacteria, protozoa, rotifers, plant cells and fungi. Nevertheless, many of Leeuwenhoeks contemporaries dismissed him as a dilettante, a man of fertile imagination. His insights never caught on. Indeed, it was not until the mid-1800s - the time of Louis Pasteur - that the idea of microorganisms was widely accepted. Even today some scientists insist that Leeuwenhoek could not have seen what he claimed to observe through his simple, single-lens instruments. Brown soon determined that this feature was common to the cells of many organisms. He later dubbed the structure what we call it still: the cell nucleus. As was Leeuwenhoek, Brown was often underrated. Some contemporary textbooks even say that he observed only the motion of pollen grains, not the far tinier movement within cells. 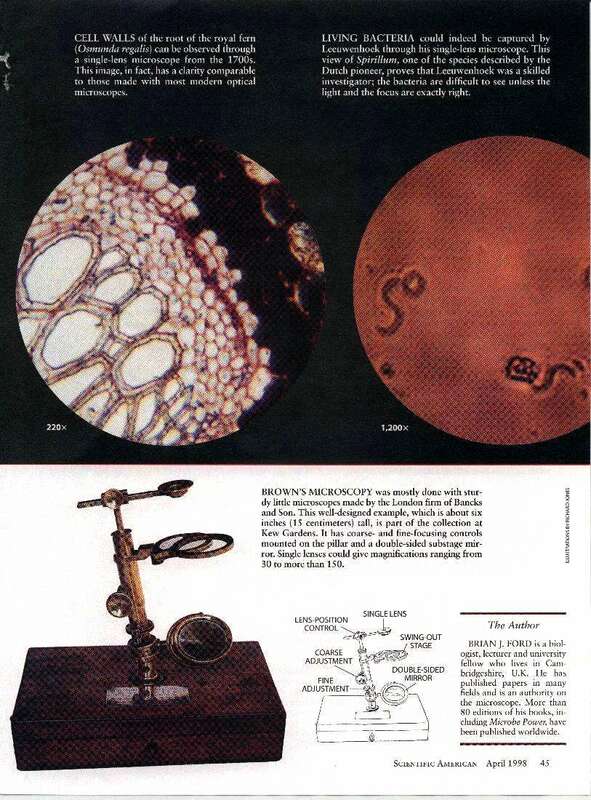 Further, one recent assessment of Browns microscope concluded that the instrument might have been a useful aid for dissection, but it could not have resolved structures as small as a nucleus, By using these scientists original microscopes - and by making single lenses myself - I, too, have re-created many of their original experiments. It is difficult work because there are no detailed accounts of the methods these two biologists used and because much care must be taken to adjust the microscopes and adhere faithfully to the experiments. Yet I have found that, contrary to the claims of many, a simple microscope can reveal living bacteria, cell nuclei and Brownian movement. Using Browns microscope, I can even resolve mitochondria, which are hundreds of times smaller than the cell nucleus. Leeuwenhoek and Brown were honest scribes. The images presented here have not been enhanced. They show how exciting and beautiful these early views were. 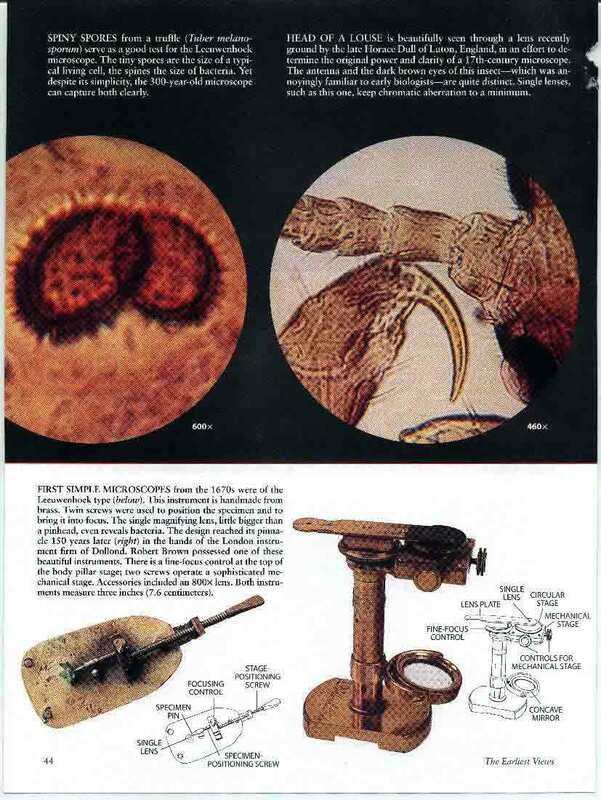 And they reveal how the simplest of instruments - in this case, straightforward single-lens microscopes from the 1600s and the 1800s - can alter our perspective forever. 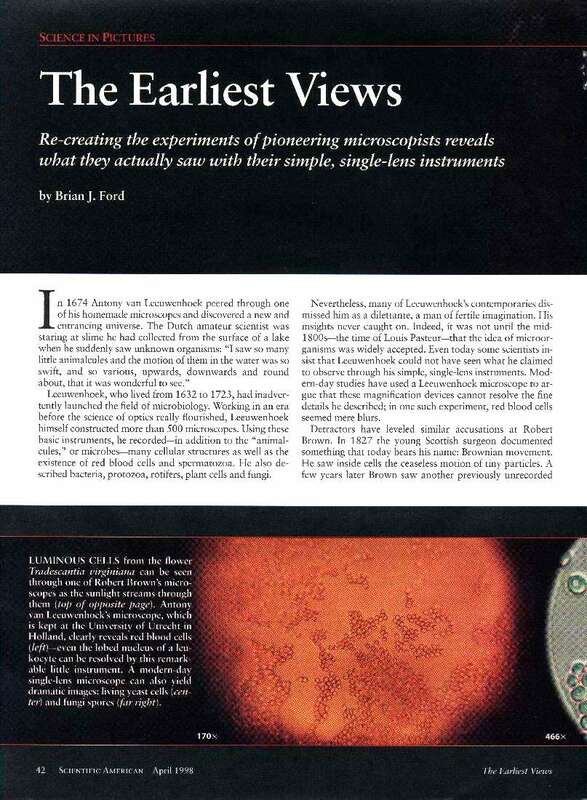 Go to original pictures taken with Leeuwenhoek type microscopes.